UPDATE: Take this with a grain of salt. The authenticity of these reports have since come into question, despite coming from a reputable source. The womp rat is officially out the bag! 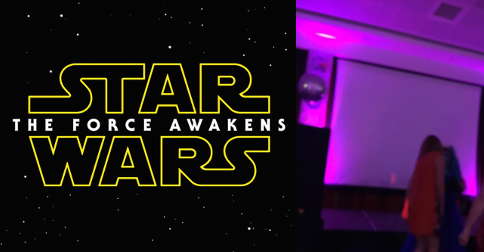 According to tweets from several attendees at tonight's UK Garrison dinner, members of the 501st legion were given a first look at the Star Wars: The Force Awakens teaser trailer that is rumored to be released publicly next weekend. The following are tweets from two members of the Jedi News team. Following descriptions of the trailer leaking earlier this week from multiple sources, today, a GIF of the Millennium Falcon on the attack flying through space surfaced on Reddit. We have yet to hear confirmation from any reliable sources concerning the authenticity of the GIF, however the Falcon has been confirmed to be in the trailer by James Burns on Twitter. UPDATE: Brian Cameron has now deleted one of the photos he posted to Twitter, and is claiming no trailer was actually shown. Regardless of whether or not this was an elaborate ruse, rumblings about the trailer's contents and release date continue to pile up, and we believe the release is imminent. Nobody saw any trailer. Period. End of. Stop. Think. Breathe. Patience. Some unknown day and time we will all see it as one. I want to see this trailer leaked. Hopefully it'll et officially released online soon. Either this week, next week, or next month. I think they saw it, but LFL smacked their hands for tweeting about it.